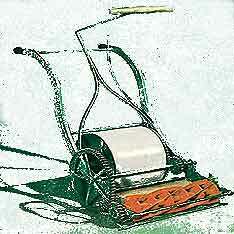 Mechanical mowing became possible early in the 19th century by an English engineer named Edwin Budding. While working in a textile mill, Budding noticed a machine that was used to shear the nap of velvet, which to Budding, was very similar to his overgrown grass at home that he had to cut with a scythe every Saturday afternoon instead of going down to the pub and listening to reports of the soccer game come in. Through Budding's ingenuity he developed a cylinder, or reel-type mower. It was a series of blades arranged around a cylinder with a push handle. It really looked much like our nonpolluting, non-powered, aerobic workout, lawn mowing machine of todaythe classic reel mower still available in many hardware and home improvement stores across the country. In 1870, Elwood McGuire of Richmond, Indiana designed a machine that basically brought push mowing to the masses. It was lighter, easier to push and had fewer moving parts than the old versions. By 1885, America was building 50,000 lawnmowers a year and shipping them to every country on the globe. Towards the end of the 19th Century, men from all walks of life, began realizing what a chore it was pushing one of those clunkers around the yard every week, so they started tinkering with ways to get more power (meaning more non-human power) behind the mower. First they figured the best thing would be to hook up a horse to the mowing machine, but the wife complained about the horse trampling her favorite roses. Then someone got the idea of using a steam-powered engine to push it around the yard, but in reality, it took longer to fire up the boiler than it did to actually cut the lawn. In the United States, the first gasoline powered mowers were manufactured in 1919 by Colonel Edwin George (you had to guess that it would take a military man to get some real power behind those whirling blades). However, before the Second World War the power mower was little used in most neighborhoods. It wasn't because that husbands didn't want to have one of those new powered mowers, it was because we were in the midst of a slight depression in the economy and it was kind of hard to explain to the wife that you'd like to buy a power lawn mower instead of buying food for the family for the next six months. During World War II, when most of the able-bodied men were off fighting the war, women were left at home to take care of the yard themselves along with cooking, shopping, cleaning, and oh yes, all that working in the factories business. I think that was the real secret to the power lawn mower boom that followed the war. When the fighting men came home, they didn't want to mess around with cutting grass with an old push mower. After all they had been out driving about the world in tanks, and jeeps, and bombers and such. The idea that now they were relegated to pushing an old 19th Century lawn mower around the backyard, just didn't quite cut it with the GI's. Not being shy about such things, they told their wives that they weren't going to cut the grass anymore, after all, it was woman's work. Women in mass stood up and in a quiet revolt pointed their respective husbands towards hardware stores across American in search of the power mower. Things haven't been the same since. By the early 60s gasoline powered mowers were so common that in 1961 C. B. Mills, an expert in grass seed and lawns at the time, said this about powered mowers: "Today, if all of them in a single neighborhood were started at once, the racket would be heard round the world." He probably lived next door to someone who liked to cut his grass early on a Saturday morning. Today, new technology is bringing us improved mower versions. Low emission gasoline engines with catalytic converters are being manufactured to help reduce air pollution. Improved muffling devices are also being installed to reduce the noise pollution. Battery powered mowers are also becoming practical. Although slightly smaller with an average cutting swath of only 17-19", these new mowers will quietly cutting lawns without the common cloud of blue smoke hanging in the air, for about an hour per charge. Prices are comparable to a high-end gasoline powered mower. America's love affair with the lawn mower is here to stay. There's something about cutting your lawn that drives some basic need in man for order and regulation that a freshly mown lawn gives us. The feeling of standing behind that smoke belching, engine roaring, grass throwing machine is like no other feeling I know, unless of course you like to ride your Harley-Davidson around the backyard on a Saturday afternoon. The original Lawn-Boy was manufactured by the Evinrude Company, founded by Ole Evinrude, who produced outboard motors for boats. The Lawn Boy became the first one-handed reel-power mower introduced to the American public.